At NorthEast CrossFit, we’re in the business of changing lives through CrossFit here in Westchester County. Tell us your success story, and we’ll not only share it, we’ll also do victory laps around the box! Just look at a few of our members’ stories, and you’ll be just as inspired. I joined CrossFit by accident. Since I was a teenager, I have had herniated discs in my lower back, for which I have had surgery and several other invasive procedures. Because of this, I was led to believe that weightlifting, and more specifically CrossFit was the worst possible thing I could to my body with this condition. After trying a class with a friend out of town once, I was hooked and completely wrong about all of my preconceived notions of what CrossFit was. After explaining my injury and medical history to the coaching staff at NorthEast CrossFit, they modified almost every workout for me and found I was able to complete almost everything along with the class. This got me hooked. I always felt like I was so far behind everybody else when taking fitness and exercise classes. I was never as flexible or balanced as anyone in yoga and could never keep up with anybody in a cardio class. Weightlifting was just out of the question. After NorthEast CrossFit, all this changed. The community is amazing and never once made me feel as though I could not keep up. Instead, even when my workouts were modified and I still was finishing last, the rest of the class would cheer me on and motivate me to push through some of the tougher workouts. Manny and the coaching staff at NorthEast CrossFit always check in on me and not only modified workouts to ensure they were safe, but monitored and pushed me when they knew I could do more. Now, the coaches check in on me every time I am at the box and consistently recommend new exercises or stretches I can incorporate to make sure my back stays strong and healthy. I have been a member at NorthEast CrossFit for almost two years now and for the first time in over 10 years, cannot remember the last time I had serious back pain. I can say with confidence that NorthEast CrossFit has helped me change the quality of my life for the better and I believe I am fitter and healthier than I have ever been before starting here. I have been a member at NorthEast CrossFit for over three years and I couldn’t be happier with my experience! The facility is huge and top-notch, but more importantly the coaching staff is very knowledgeable, dedicated and caring. Regardless of your level, the coaches are focused on helping you reach your health and fitness goals with a very personal approach. All the coaches are regularly attending workshops and classes to enhance their knowledge and offerings. The time and effort put into their professional development results in very thoughtful class programming and instruction. In addition to the outstanding coaches, there is a great community at NorthEast CrossFit. It is a fabulous place to feel connected and supported as you improve your fitness. Above all the coaches and community make it fun to work out and they will keep you coming back! I was scared out of my mind to walk through the door. I am 47 and currently very overweight. I have not had the best experiences going to any gyms. Often I just do not know what to do or I am just spinning my wheels and never feeling like I did much. One on one trainers are expensive and seem to just stand there and tell you what to do. 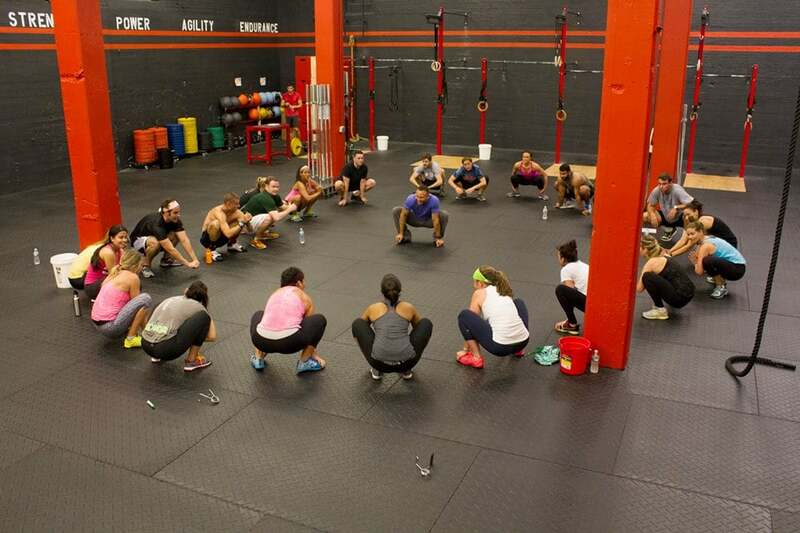 From the moment I walked into Northeast Crossfit I felt a warm welcome. No judgments here – just support. The coaches were kind, knowledgeable and super positive. Coaches take the time to show you how to do something and watch to make sure your form is correct. Tasks were modified so could work hard and experience an amazing workout. Everyone there is working on themselves, supporting one another and creating a very positive atmosphere. There are many things that I cannot do YET but I know in time I will reach my goals and make new ones. Based on the amount of sweat I create and the “good sore” feeling of the next day I am doing something right. I believe there is a time and place for everything in life. At this time and at this place, Northeast Crossfit is going to help me transform into a better, healthier, and happier person! What's not to love? The energy here is infectious!! Best strength supplement to my endurance training and I love the team spirit and atmosphere. No snobs allowed! The BEST! Checked out a few other crossfit boxes and this one was by far the best; facility & coaches really had a good vibe. Couldn't have picked a more supportive group of coaches and fellow crossfitters. This box has fantastic reviews for a good reason! Can't say enough good things about NorthEast CrossFit! The coaches are all so supportive and helpful -each one really takes the time to get to know and help you. Classes are challenging but fun, thanks to the motivating coaches and members. So glad to have found NorthEast CrossFit! It's a fantastic CrossFit box. The coaches are all top notch and the facility is great. The workouts are excellent and combine a strength portion with an "I'm going to die" portion. I wouldn't go anywhere else.